When Kim Jong-un visited S Korea: What does this engagement really mean? US President Donald Trump pledged Thursday to complete a deal on denuclearising the Korean peninsula together with North Korean leader Kim Jong Un, signalling that negotiations remain alive after weeks of an apparent deadlock. "Kim Jong Un of North Korea proclaims 'unwavering faith in President Trump.' Thank you to Chairman Kim. We will get it done together!" Trump wrote on Twitter. The tweet came hours after Kim renewed his own commitment to the goal of denuclearisation in talks with a special envoy from Seoul, ahead of a summit planned in Pyongyang scheduled for September 18-20 with South Korean President Moon Jae-in. "The north and the south should further their efforts to realise the denuclearisation of the Korean peninsula," KCNA quoted Kim as saying. South Korean national security advisor Chung Eui-Yong, who met with Kim, said the North Korean leader also emphasised that his "trust in Trump remains unchanged," the comment which led to the US president's tweet. Chung added that Kim expressed his intention to work closely with the United States to achieve denuclearisation "in the first official term of President Trump," which ends in January 2021. The enthusiastic comments came 12 days after Trump summarily cancelled a trip to Pyongyang by his top diplomat, Mike Pompeo, which was aimed at getting the discussions on North Korea's nuclear talks back on track three months after Trump's landmark summit with Kim in Singapore. In a statement on August 24, Trump said he was scotching Pompeo's trip "because I feel we are not making sufficient progress with respect to the denuclearisation of the Korean Peninsula." He also slammed China as not helping with the effort to convince Pyongyang to halt its nuclear weapons and ballistic missile programme. "Additionally, because of our much tougher trading stance with China, I do not believe they are helping with the process of denuclearisation as they once were," Trump said at the time. Thursday's statements by the two leaders appeared to paper over differences the two sides have over what the current talks should focus on. Pyongyang apparently wants to first achieve an official end to the seven-decade state of war with South Korea, while Washington wants to start immediately on the long process of denuclearisation. Stephen Biegun, the newly-appointed US envoy for the North, said last month Kim had promised "final, fully verified denuclearisation" at the Singapore summit. But Pyongyang has slammed Washington for its "gangster-like" demands for complete nuclear disarmament. 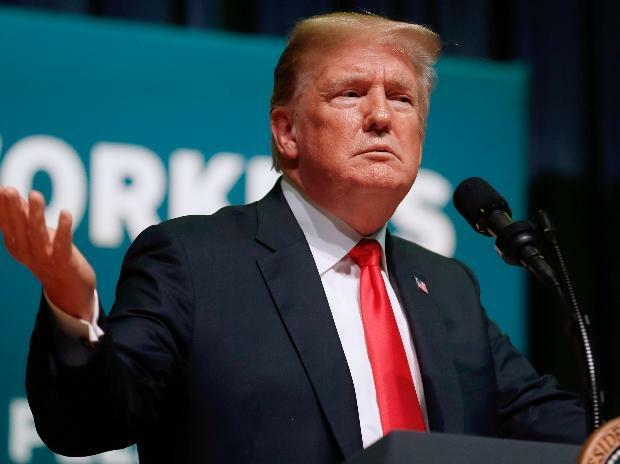 Trump's statement came hours before the US Justice Department unveiled criminal charges against a North Korean government-linked hacker involved in several major cybercrimes, including the hacking of Sony Pictures and the theft of USD 81 million from the central bank of Bangladesh. Pyongyang had no immediate comment on the charges, which it has denied responsibility for in the past, and it was not clear whether they would impact the nuclear negotiations. The State Department announced Thursday that Biegun would travel to South Korea, China and Japan next week for talks on North Korea. In New Delhi Thursday, Secretary of State Pompeo, the former US intelligence chief who heads the US negotiating effort, struck a sober note, saying there is still much work to do. North Korea "is the only country that has commitments under UN Security Council resolutions," he told reporters. "It is the case that there is still an enormous amount of work to do. We haven't had any nuclear tests, we haven't had any missile tests, which we consider a great thing." "But the work of convincing Chairman Kim to make the strategic shift which we talked about, for a brighter future for the people of North Korea, continues," Pompeo added.